I did up this somecard last year I believe. Chronic migraines are a special sort of madness inflicted on the brain that cannot be resolved entirely by medication. So it had to be endured a great deal. Lots of quirky neurological fun in there as well. For example, I have persistent migraine auras. So a lot of fun visual effects all the time. One of them is visual snow. So static vision that is a constant phenomenon. Another interesting neurological glitch is migraine associated vertigo. So vertigo outside of the migraine. Just whenever. For random durations and intensities. And I am constantly photophobic so I wear sunglasses and a hat whenever I leave the house. Which is not often these days because I have not been driving due to the vertigo. Not that I really want to during the day because it either triggers a migraine or makes the one I have that much worse. I actually wrote a story with a character that saw auras, real ones though, and her ability was so strong she got wicked power headaches from them. Had migraines on the brain when I wrote that. Either way, since I have been off work I noticed this makes me rather reclusive. I am on a long-term leave from work right now. 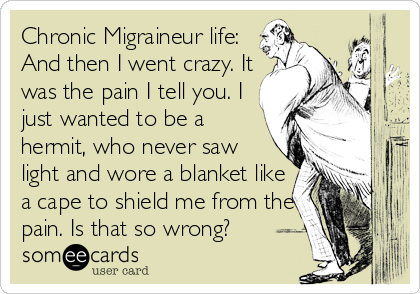 And while working with migraines that are not managed it is a horrific situation that cannot last for long without insanity at least you are forced to leave the house. Well, on the days you have the capacity to. My whole problem was that I didn’t have the capacity to. And the days I did it was just insanely painful to actually be working such that you have no capacity to do anything else but survive work. Yet, you still, have co-workers to talk to and customers with your ‘facade of wellbeing’ in place so no one realizes how much pain you are in. Most people with chronic pain have that mastered. And we can function decently at the 7 level of pain but not so much when it gets to the 8 range and not at all at 9. So there is a range. I miss the interaction though. I may be an introvert and completely and utterly comfortable being a hermit but some social interaction does seem normal for a person. Yet, due to work consuming every inch of my energy and desire to function, I had long since drifted away from my friends as I had nothing to give them. No time. No energy. No nothing. So now that I do have some time, some energy… they are all gone. And I am just a hermit with social media power. I connect with people online which works for me. Still, think I ought to leave the house at least once a week. Once spring starts of course. That goes without saying really. It is frigid out there. I wonder if that will affect my writing? Being a hermit that only leaves the house to talk face to face with actual people like once a week? Hmmm. Good thing I write fantasy I think. I can become this weird reclusive writer you never see until the book is done. Or maybe I should find myself a coffee shop and go there once a week and do my book working there. Around people. A change of scenery and out of the house.